Slow and fast twitch muscle fibers are the fundamental building blocks of your muscle. With enough fast twitch muscle you can be a world class sprinter or swordsman, and with more slow twitch muscle fibers you'll outpace everybody else in a marathon. The photo to the right was taken of a mouse's quadriceps with an Olympus BX50 microscope. The Hematoxylin stain makes each individual circular muscle fiber easily identifiable – and also gives it the blue shade. IIB contains an isoform of itself (an alternate type, identical but for one base pair of genetic code) that closely resembles IIx. Thus, in some texts IIx and IIB are used interchangeably (and most unhelpfully), and IIAB is also referred to as IIAX. Wow! OK, it's not as complicated as it looks. The different classifications of the muscle fiber types don't correlate exactly with each other. 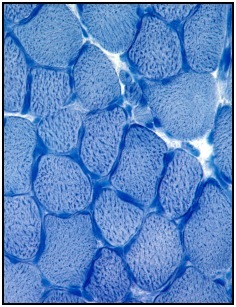 As more studies are done, finer and finer distinctions are being discovered between the different types of muscle fiber. For example, "…correlations between type IIA and FOG and type IIB and FG fibers are more varied." The table above gives you a good idea of what the different muscle types are. But if you're gonna go to grad school or beyond to study this stuff, you'll find out that the table above doesn't perfectly line up. For most people , just knowing Type I and Types IIA, AB, and B is good enough. I'll mostly just talk about these major divisions, though Type IIx will make a cameo appearance. Can contract for a long period of time, but with little force (e.g. jogging). Use an oxidation reaction to work (i.e. using oxygen, or aerobic), using fat or carbohydrates for fuel. Do not have the potential mass gains that Type II fibers do. Contract powerfully, but fatigue quickly (e.g. sprinting and weight lifting). Mostly use anaerobic reactions to work (without oxygen), using specially stored muscle sugar (glycogen) as fuel. Have little, if any, endurance. Possess great potential to gain mass. Type IIA: Powerful, but poor endurance. Type IIAB: Medium power and endurance between Type IIA and Type IIB. Type IIB: Worst endurance (2 to 10 seconds), but most powerful. 'Slow' and 'fast' don't actually refer to the speed at which the individual muscle cells contract. Instead, it refers to how quickly they fatigue. For example, slow twitch fibers fatigue slowly. This allows you to jog 5 or 10 miles if you want to (and have a bit of training). Fast twitch muscle fibers are much stronger, and if you want to lift something heavy or forcefully you'll use them - but they fatigue very quickly. You can't lift weights with the same muscles for hours upon hours, day after day. It just doesn't work like that (assuming you're actually lifting a heavy weight). What Determines How Much of Each Type I Have? Primarily the lottery of genetics. However, your choices also affect your makeup. You love those mixed answers, right? The primary training factor is the blessings that your genes give you. However, since the '70s and '80s, research has shown that some muscle plasticity applies to humans. For example, Olympic sprinters have a high ratio of Type II muscle fibers, especially Type IIx - the über-powerful, best Type II fast twitch muscle fibers. Whether it is a result of training, or genetic mutants finding a sport that they excel at, we don't know yet - probably a combination. But subjects with lower body paralysis from spinal damage have an even higher ratio of Type IIx fast twitch muscle fibers!8 Of course, because their leg muscles have atrophied from disuse they have much less muscle. But after 5 to 10 years there were virtually no slow twitch muscle fibers in biopsies of their Vastus Lateralis thigh muscles! Though it's still worth pointing out that 100% of that fast twitch muscle fiber was not a lot of muscle at all. In a separate study, 9 young and sedentary Danish men were placed on a weight training routine for 3 months. Muscle biopsies were taken before the training, during the training, and at the end of the training. Their amount of Type IIx muscle fiber went from 9% before training to about 3% after 3 months of training (the Type IIx was being converted to Type IIA, ideal for lower intensity weight training). And then, incredibly, after another 3 months of being sedentary, their Type IIx fast twitch muscle fibers had increased to 18% -- even though they had 3 months off of training! This rebound effect is well documented. And a third observation about fast twitch muscle fiber… that's the muscle fiber that decreases most with age. Mostly because people never give it an adequate stimulus, and their main activities involve walking around and sitting down - aerobic, slow twitch muscle fiber activities. We train ourselves to be slow. Though genetics plays a big role, you can influence and even change your muscle fibers. Workout really hard to activate as much of that fast twitch muscle fiber as possible, and then really rest. OK, How Do I Use What I Know About Muscle Fibers In My Training? To build more fast twitch muscle, take 7 to 10 days off between going to the gym, or longer. That's the best prescription for growing a bundle of fast twitch muscle fibers. When you do anything physical, you contract the least amount of muscle to do it. This comes from your evolutionary desire to conserve energy - it wouldn't make sense to engage 100% of your arm muscles when you lift a teacup. Thus, to really adequately fatigue your muscles you need to fatigue out the slow twitch muscle. Then fatigue out the weaker Type II fibers until you are forced to engage your premium Type IIB and Type IIX muscle fibers. Muscle cares only about the force of a muscle contraction, not how fast you want to move. So you can practice safely at a slow pace, as long as it's intense. Each muscle (e.g. bicep muscle) contains tons of motor units. A motor unit is comprised of the single nerve that runs to a group of muscle fibers of the same kind in your muscle. Each slow twitch motor unit is made up of about 100 muscle fibers. But each fast twitch motor unit has about 10,000 muscle fibers! So each fas twitch motor unit is about 100 times more powerful than each slow twitch unit. And that's why you want more of these guys! The ratio of slow twitch motor units to fast twitch motor units varies from person to person, and from muscle to muscle. For example, ab muscles, used primarily to stabilize the body, are mainly slow twitch. And biceps, usually only fully engaged when you're lifting something heavy, are predominantly fast twitch. Oh, and when a motor unit contracts it contracts 100% of the fibers in that unit, with 100% of its force. So training to be able to use your fast twitch muscle better, and to increase their size, really builds strength! When you lift a weight, you fatigue out your slow twitch muscle fibers first. They are the easiest to recruit. Only for the last few repetitions will you engage your fast twitch motor units - the premium stuff! Now, if you use too light of a weight you will never engage your fast twitch muscle fibers. You'll just use your Type I slow twitch fibers, and maybe your Type IIA fibers. If you use too heavy of a weight, you'll only be able to do one or two repetitions of the lift recruiting all the muscle fibers you have. And when your premium Type IIb and/or IIx muscle fibers give out, you won't be able to lift the weight anymore - but the rest of your muscle fibers will be left unfatigued. Wouldn't it be great if you could fatigue all your muscle fibers at once? Well, you can! If you use a moderate weight, one that you can handle for 60 to 90 seconds of repetitions of your lift, then you have the weight right in your 'sweet spot'. You'll fatigue out the slow twitch muscle fibers, and as they give out the fast twitch fibers will come online. And the fastest of the fast twitch will come into play for the last 10 seconds of the lifting, when you can barely move the weight at all - but you keep trying! It's intense, but you can fatigue all your muscle fibers that way. So everything gets stronger! But… you only engage your best Type II fibers for the last 2 to 20 seconds of your lifting. That means you have to push on hard right to the very end. And If I Want to Lose Fat…? Actually, weight lifting is a great way to burn fat for quite a number of reasons! For a start, the biggest stores of muscle sugar (glycogen) are kept in your fast twitch muscle fibers. So by exercising them you empty them of a lot of glycogen, and burn a lot of energy! And fast twitch muscle fibers burn lots more energy when they contract than slow twitch muscle fibers do. Type IIA burns 3 times as much as Type I slow twitch muscle fiber, and Type IIx burns 4 times as much energy as your predominant slow twitch muscle fiber. There is all the info you should ever need about slow and fast twitch muscle fibers. And even some tricks that most people don't know about how to increase the amount of Type II muscle fiber that you have. • Click here to leave 'Build Fast Twitch Muscle Fibers!' & go back to the Home-page! 1. Baechle, Thomas R., and Roger W. Earle. 2008. Essentials of Strength Training and Conditioning: National Strength and Conditioning Association. Champaign, Ill: Human Kinetics. Pp. 9 - 10. 2. Scott W, Stevens J, Binder–Macleod SA. "Human Skeletal Muscle Fiber Type Classifications". Journal of the American Physical Therapy Association. 2001; 81:1812. 3. McGuff, Doug, and John R. Little. 2009. Body by Science: A Research Based Program to Get The Results You Want in 12 Minutes a Week. New York: McGraw-Hill. Pp. 45. 5. Ibid., p. 44, 50. 7. Jesper L. Andersen, Peter Schjerling, and Bengt Saltin. "Muscle, Genes, and Athletic Performance". Scientific American (September 200). 10. Ibid., pp. 51 - 52. 12. De Vany, Arthur. 2011. The New Evolution Diet: What Our Paleolithic Ancestors Can Teach Us About Weight Loss, Fitness, And Aging. Emmaus, Pa: Rodale. Pp. 117, 133. 20. De Vany, pp. 95.